Yogi Berra is a guy typically seen in Yankee camp. I’d expect he loosens up some of the shy, yet competitive prospects. No? For his out-of-this-world humorous personality. For winning 10 World Series rings — the most ever by anyone. For still believing he tagged Jackie Robinson before he touched home plate in the 1955 World Series. My favorite Yogi-ism: “When you get to a fork, take it.” This link to tons more Yogi-isms will make your day. I promise. 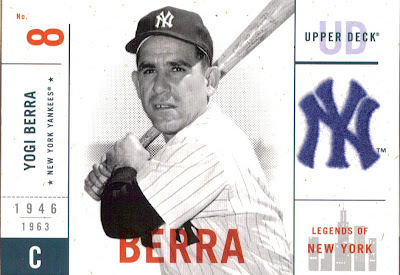 Fun fact: Berra grew up in the same town my mother did, Montclair, N.J.